The Tynedale Archaeology Group has been conducting a long-term study of the archaeology of the area immediately to the north of Hadrian’s Wall. 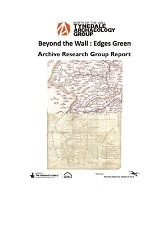 The Beyond the Wall: Edges Green Project is a part of this endeavour and is a year-long study supported with funds from the Heritage Lottery Fund and the Northumberland National Park Authority. The project has produced an Interim Reports and a Final Report, called Edges Green Landscape Survey. Edges Green is well named as it can be seen as an “edge area”. Physically it is on the edge of the Tyne Valley, between the more sheltered and better farming land of the valley and the more difficult and inhospitable upland above 300 metres. In farming terms therefore, it is a marginal upland area.